Thandai used to be a popular drink at Agyawanti’s maternal home. But when she came to village Chaina in Faridkot district of Punjab after marriage, she discovered that tea was the chosen drink. 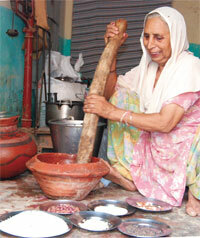 Then, last year she was asked to make thandai at a food festival in her village. “It was after 40 years that I prepared it. Despite my age I remembered the recipe. Maybe it is the nuts I had in thandai as a child that keep my memory sharp,” joked the 65-year-old. Thandai means “coolness” in Hindi. But it not only cools the body, it also has medicinal properties. Its main ingredients are poppy seeds and nuts. “It was our sole remedy for cold and fever since we did not have pills to rely on,” said Agyawanti. Take almonds, poppy seeds and watermelon seeds. Soak them in water overnight. Grind them to a fine paste while adding rose petals and pepper corns halfway through the process. Mix sugar and a spoonful of the paste to a glass of cold water. The drink is ready to serve. To cure cough and cold, add the paste to hot milk, topping it with desi ghee. The drink has natural vitamins and minerals. It relieves acidity and constipation, increases appetite and protects against dry, hot winds in the summer, she said. It rejuvenates the body and mind, so men would have it when they came home after working in the fields, she recalled. One can have it hot in winters and as a cool squash in summers. Thandai is not restricted to Punjab. It is more famous in Uttar Pradesh where a paste of bhang or marijuana leaf and dry fruits is added to cold milk and served chilled. People offer this to Lord Shiva during Holi and Shivratri and have it as prasad or holy drink. The bhang thandai induces hunger and sleep. It is not as healthy as the traditional thandai Agyawanti had as a child. Agyawanti does not think readymade soft drinks are any match to her thandai. “Cola drinks filled with gas have taken over, and on television they call them refreshing. But can’t we see the difference? These children can’t run even a kilometre without panting, forget working in the fields,” she said. It is not just Agyawanti’s family where thandai is making a comeback. It is sold in urban stores as concentrates and soluble as mixes. Just add it to water and stir.